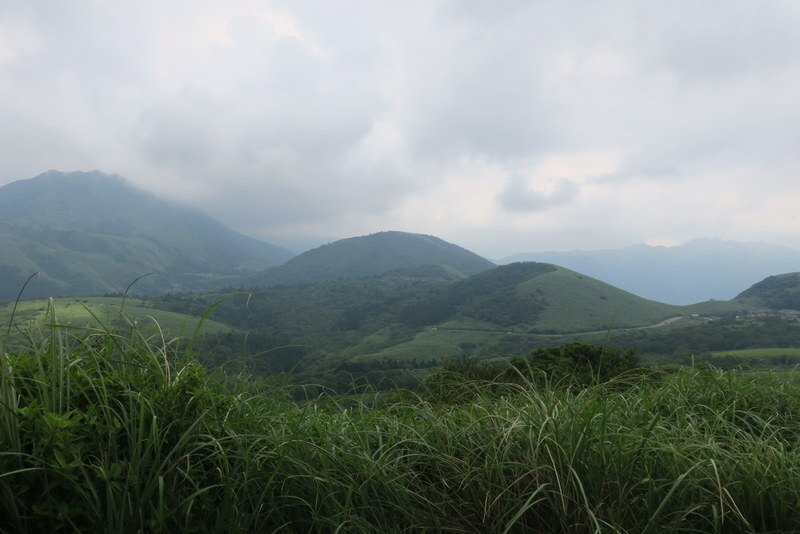 Yang-Ming Shan Mountains 陽明山 ~ before the storm…. It’s summer, well and truly summer! Schools finished yesterday, the last day of June ~ so the summer holidays have officially started ~ and everyone is making the most of it! 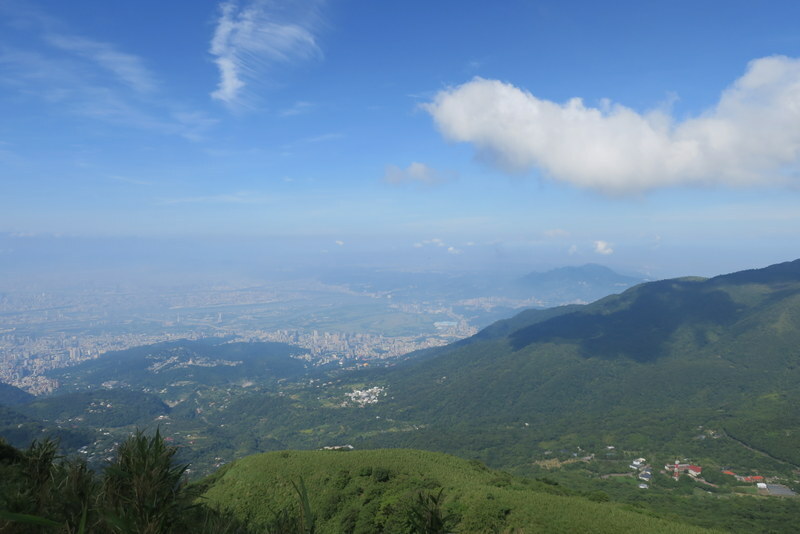 Summer weather in Taipei this past week has meant fine and sunny weather every morning, up to the mid-30’s in temps, then soon after lunch, it clouds over and a storm comes rolling in, sometimes just torrential rain, sometimes with thunder and lightning too. 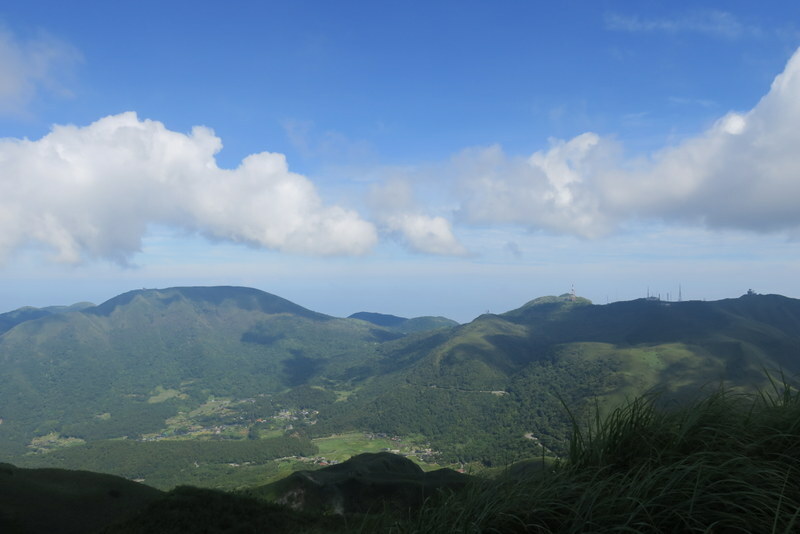 So today everyone was up early to the Yang-Ming Shan Mountains, just above Taipei, and back down again by early afternoon. 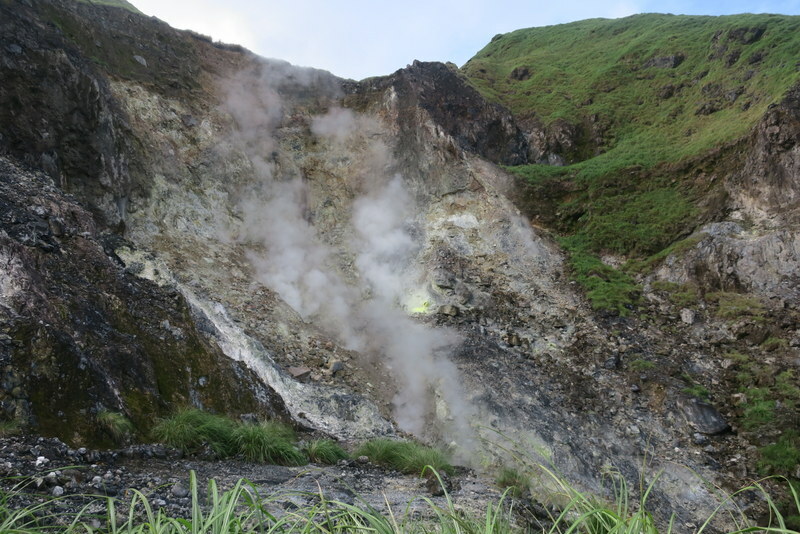 By 8:00 am I was already at Xiaoyoukeng, where the fumaroles were busy pouring forth their stinky sulphur. The smell was incredible! The noticeboard said 29°C, and that was before 8:00 am. It was gonna be a hot hot day! 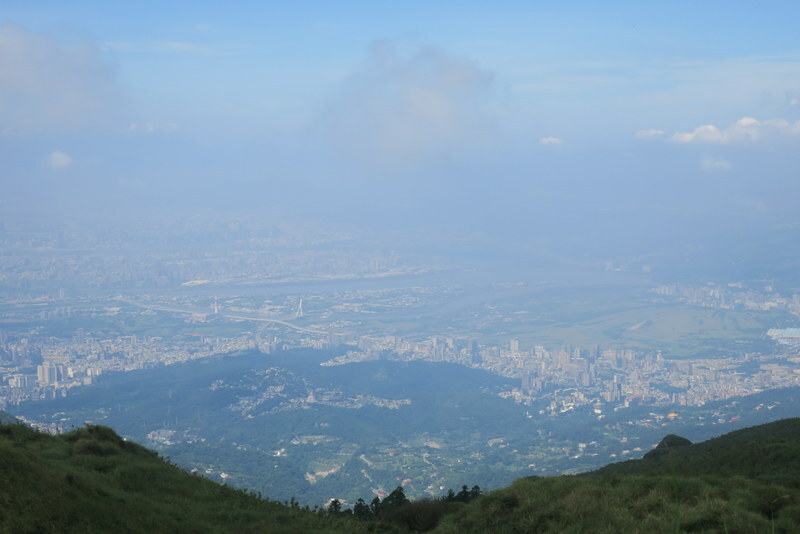 Over Dragon Boat Weekend at the end of May, I was up in Yang-Ming Shan doing the ‘陽明山東西大縱走活動’ ‘Yang-Ming Shan East-West Vertical Traverse’ over 2 days, the second day completely in the mist. 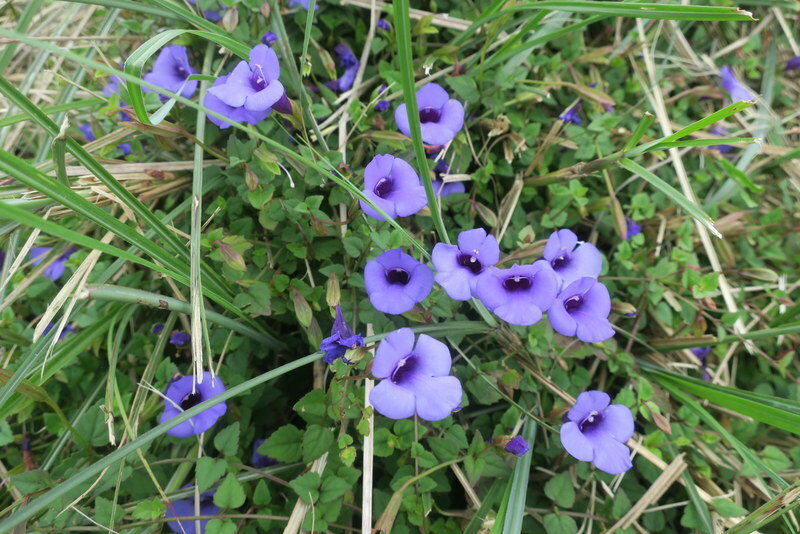 (Check out that blog post here). Parts of the eastern range were new to me, so I’ve been determined to go back and do the new sections in the sun. So today was THE day! 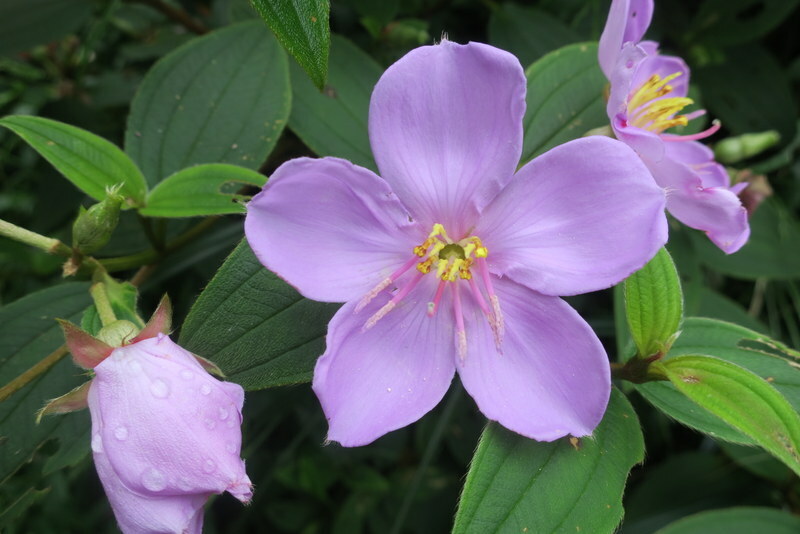 Check out the flowers – the big purple flowers are Common Melastoma (Melastoma candidum) – which has a high tolerance of acidic, sulphurous and infertile soils. 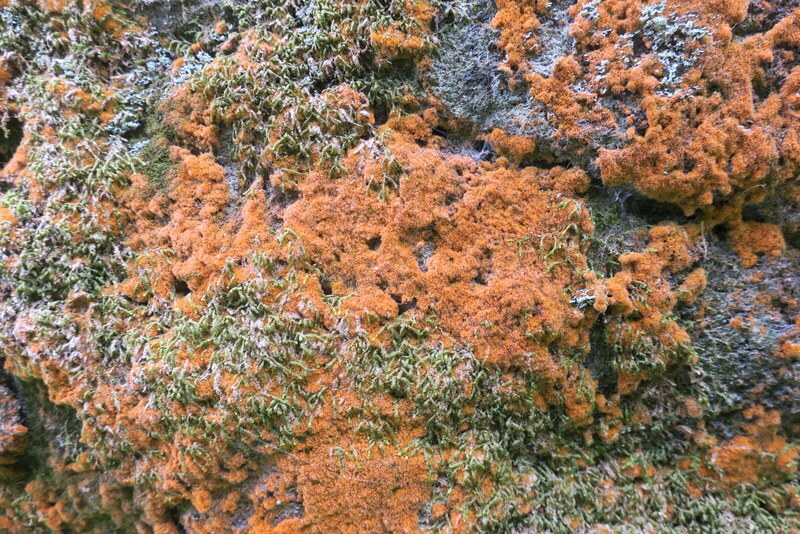 Also some beautiful lichens…..
First to Qixingshan (Mt. 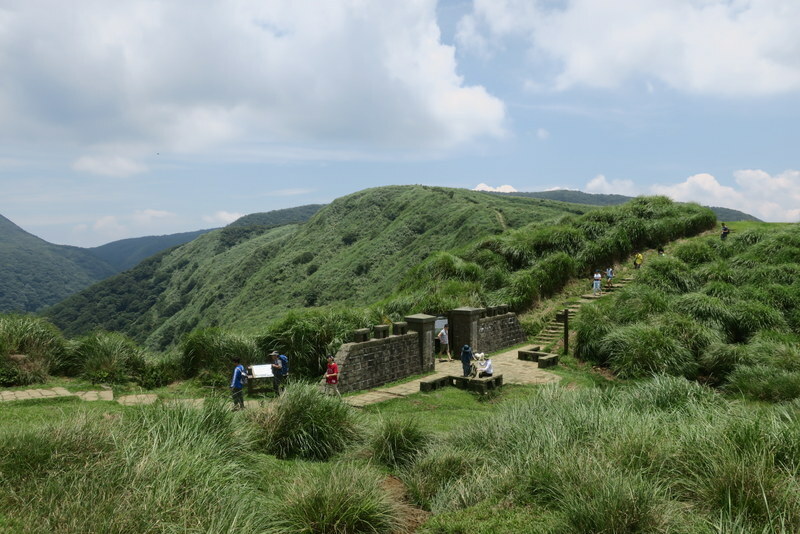 Qixing or Mt. 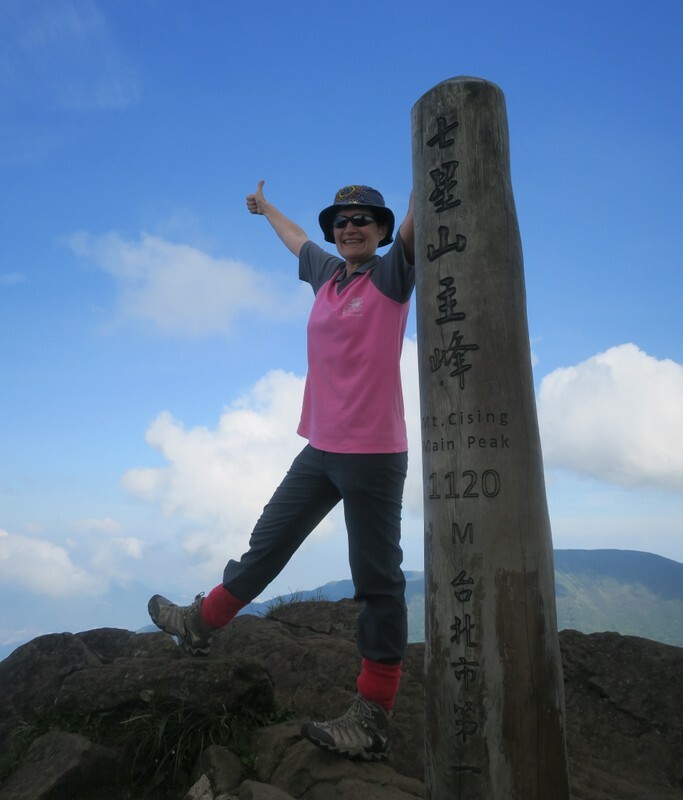 Cising), the highest peak, at 1120 m. One of my lovely students, Calvin from Malaysia was up there a few days ago, with photo to prove it, and I always tell him I’ve gotta keep up with him, so this is in his honour! 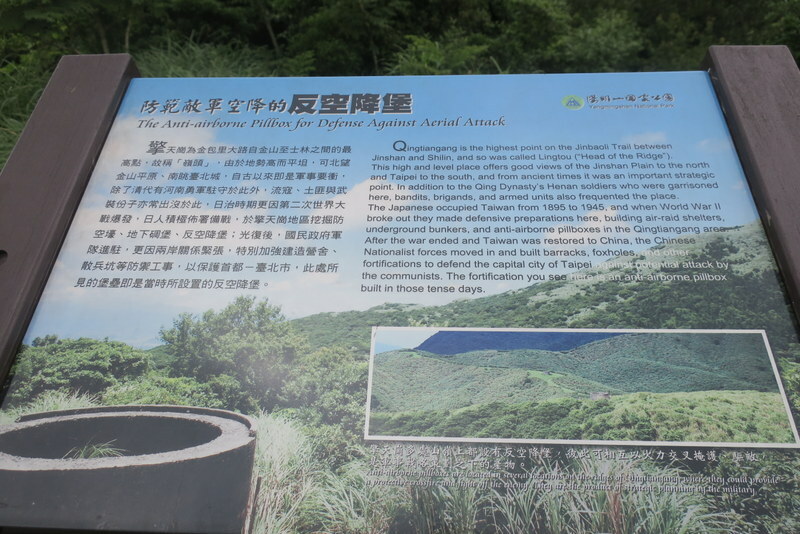 Then to Qingtiangang, “a lava terrace formed when the lava from Mt. 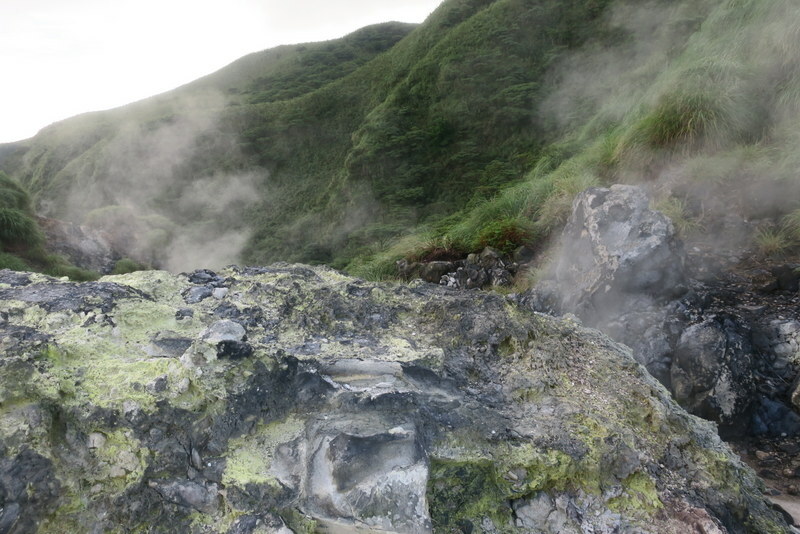 Zhugao flowed north after its eruption. 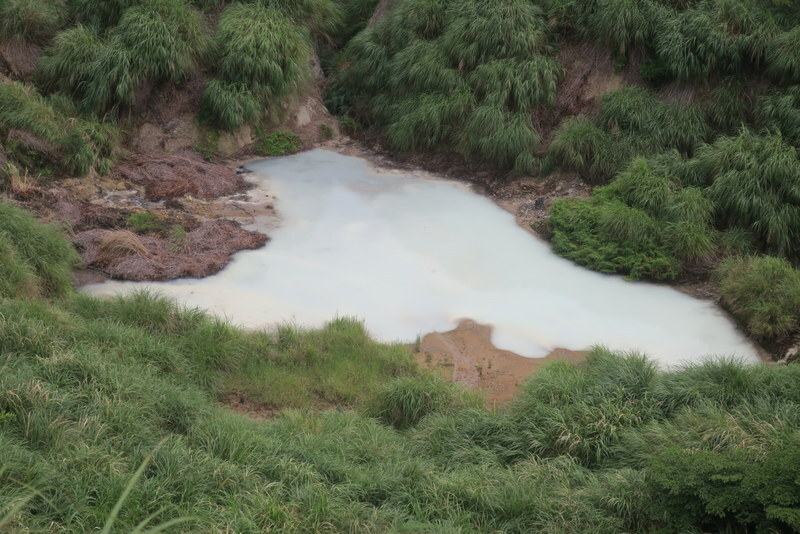 Because of its flat terrain, a ranch was established and the area was used as a pasture for grazing cattle during the Japanese occupation.” The smell there is no longer of sulphur. It is very distinctly cow. Very smelly. Very stinky cows. Never saw any, but there’s lots of evidence. 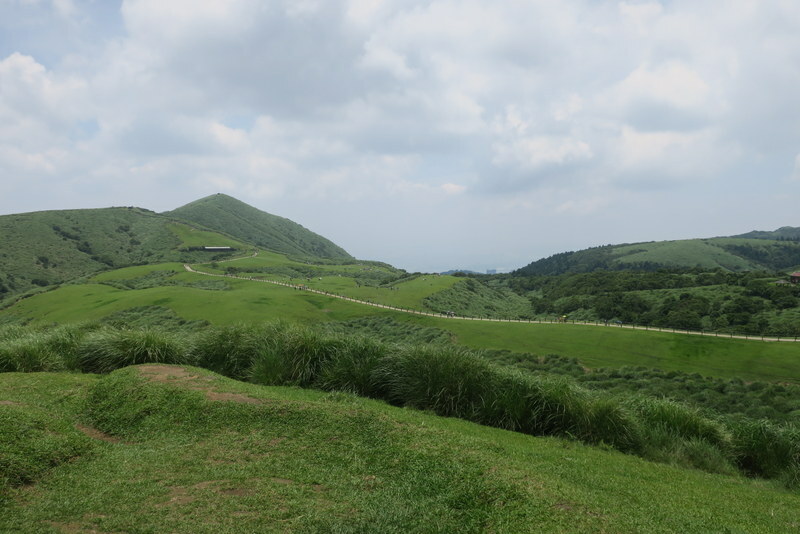 These are the grassy areas, completely different from the western end of Yang-Ming Shan…. 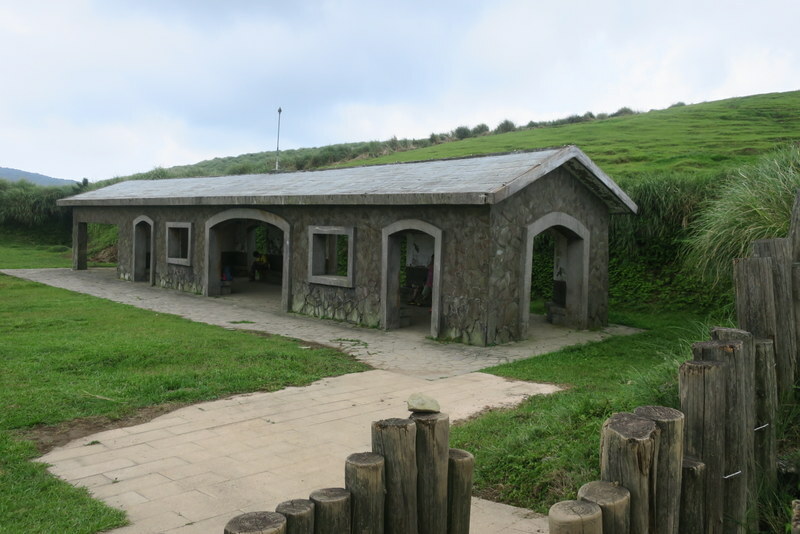 This is one of the old ranch buildings, now a rest area…. 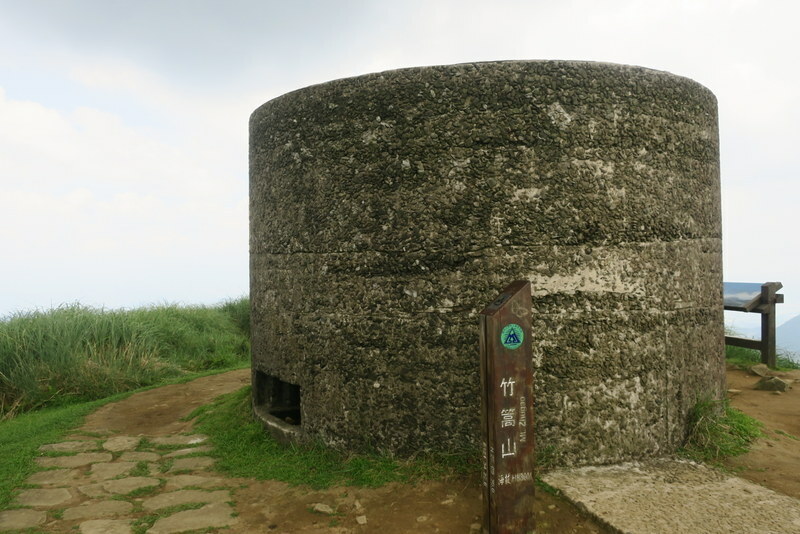 And there’s lots of historic pillboxes, including one on Mt. 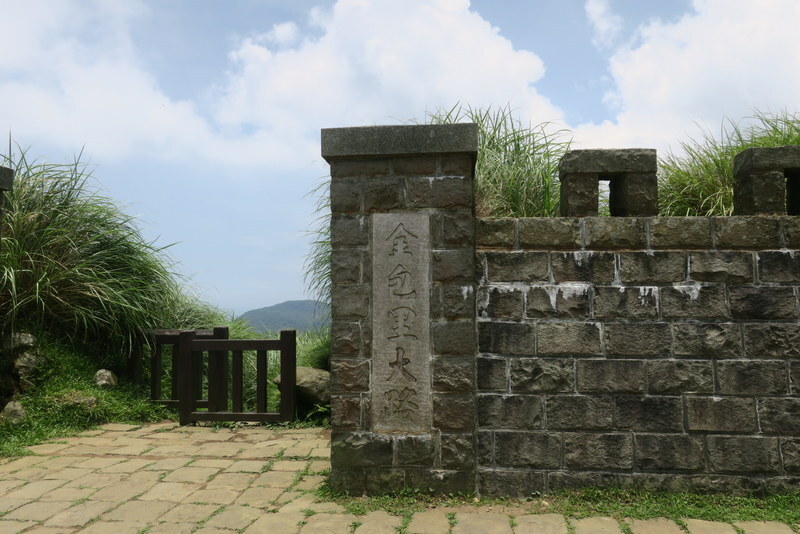 Zhugao 竹篙山at 830 m, the highest pillbox, used for defence …. 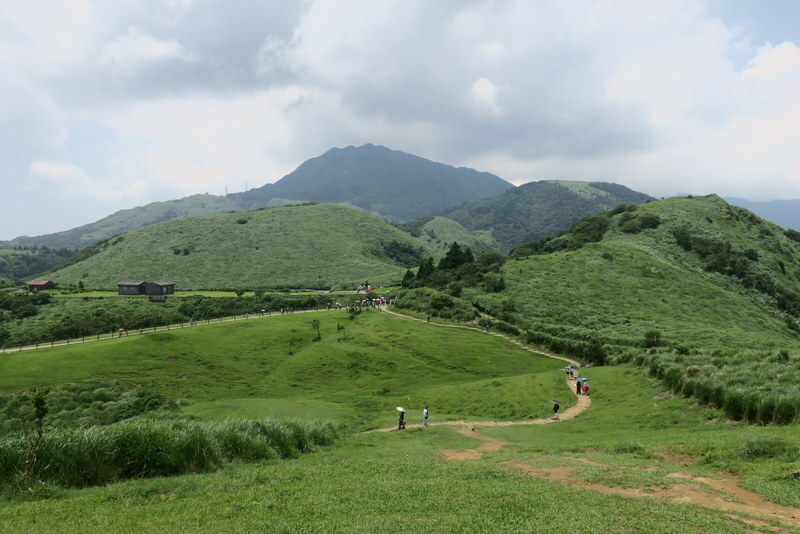 This mountain has spectacular views of Qixingshan, where I’d just come from – though it was getting quite overcast over there…..
There’s an ancient historic trail, the Jinbaoli Trail that goes over the mountains from the sea at Jinshan to Shilin in Taipei and was used to transport fish, tea and sulphur right up to the 1950’s, this is one of the old gates…. 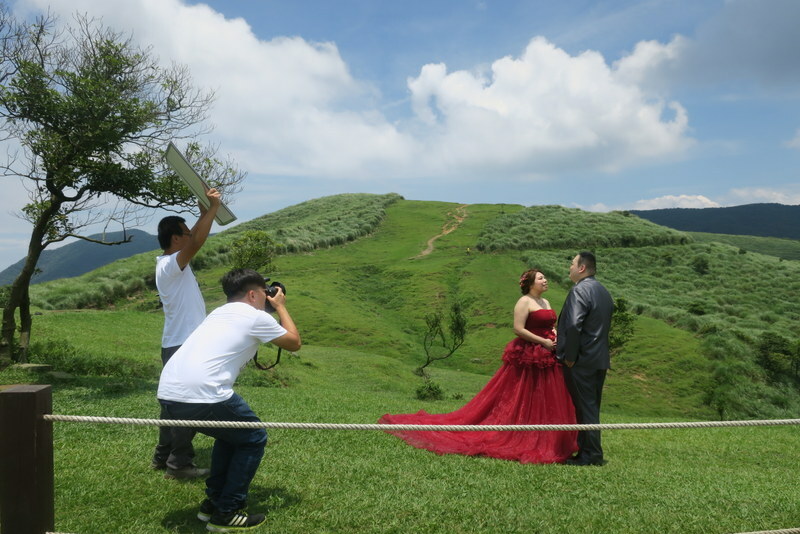 Lots of people in the area today ~ it’s THE place where couples and families and friends all come for picnics, to brew tea, play Frisbee with the kids, and even take wedding photos! 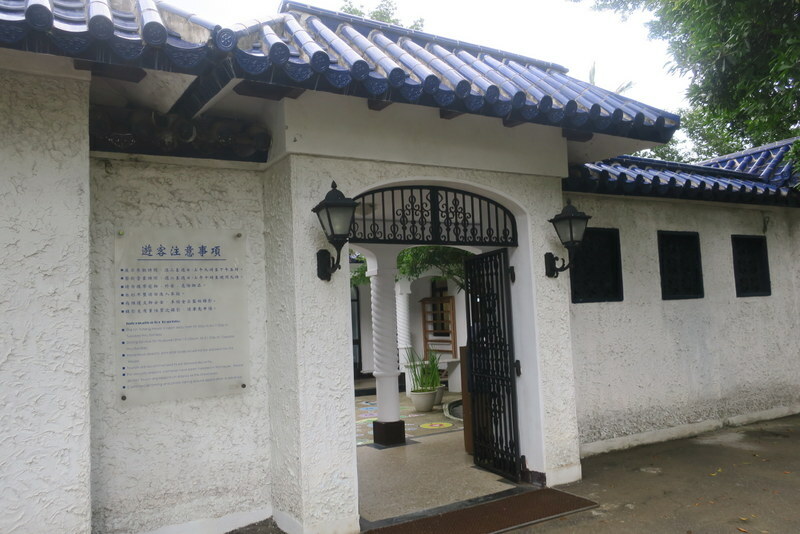 And finally I ended up at the old home of Lin Yu-Tang 林語堂 (1895-1976) on the lower slopes of Yang-Ming Shan. 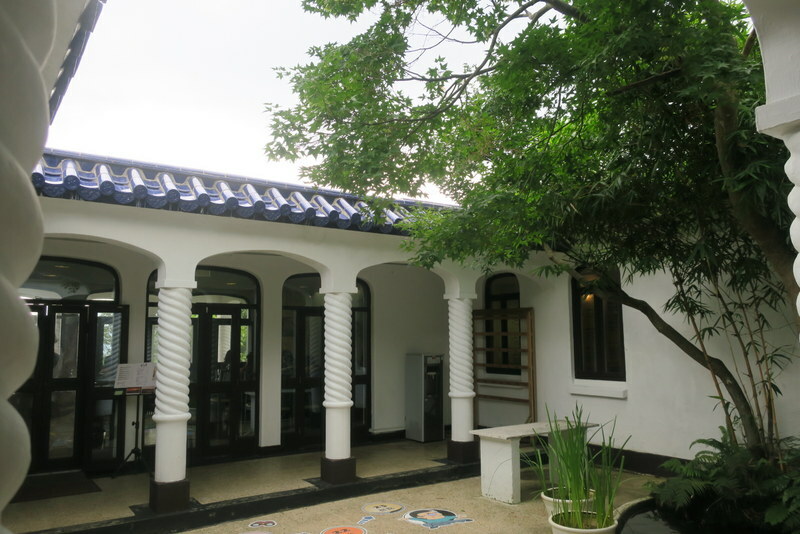 He lived there for the last 10 years of his life and wrote lots of things, mostly in bed. Not because he was confined to bed, but because he thought it was the best place to think and write and invent. That’s what the notices around his house said anyway. Am sure thousands would agree with him. 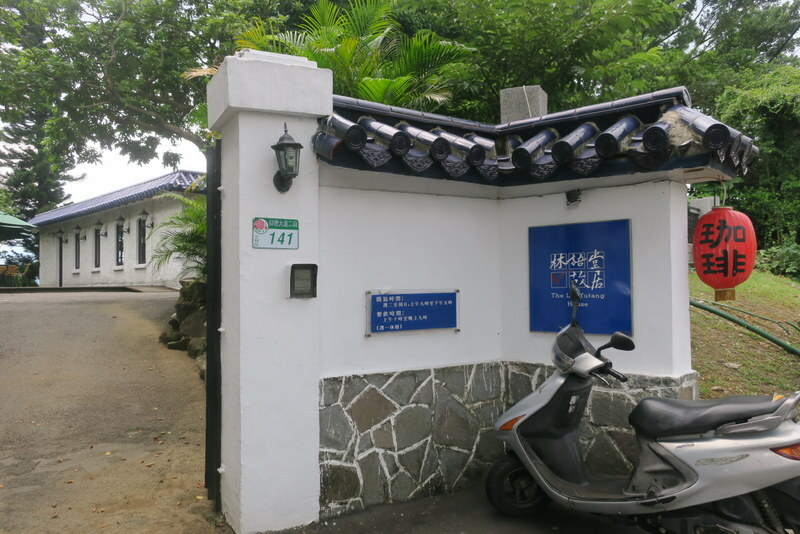 Wikipedia describes him as “a Chinese writer, translator, linguist and inventor. 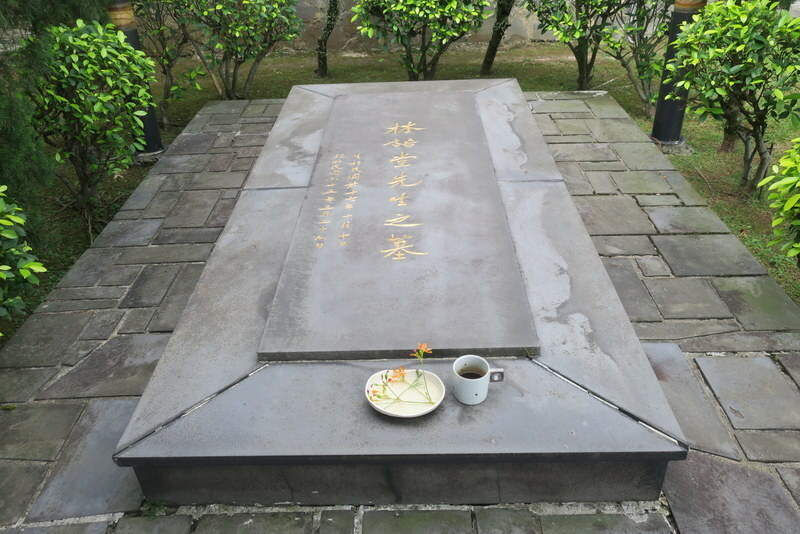 His informal but polished style in both Chinese and English made him one of the most influential writers of his generation, and his compilations and translations of classic Chinese texts into English were bestsellers in the West.” He is buried there in the garden, and his home is open to the public…. 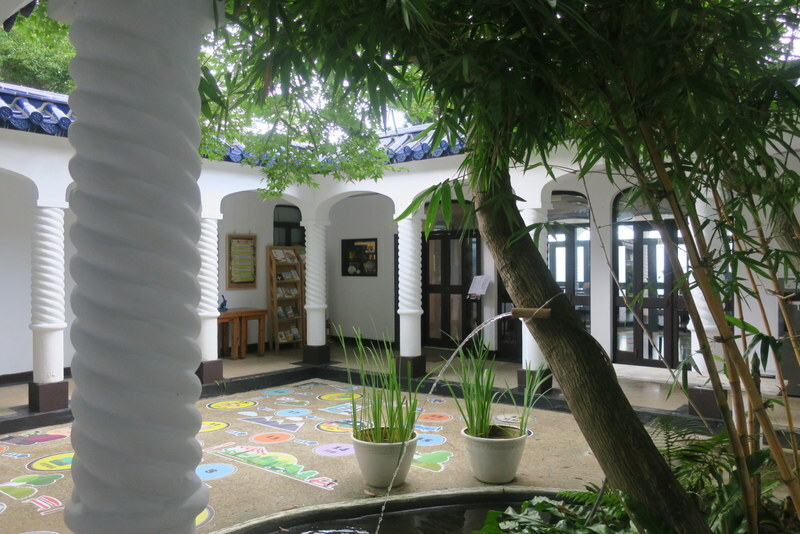 By then it was 2:30 pm and home I went, arriving back in Sanzhi just before the thunder started! 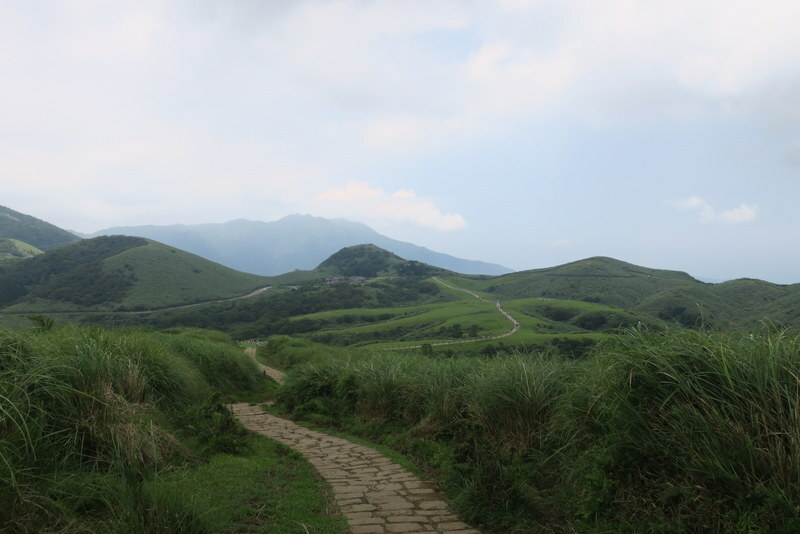 Yang-Ming Shan by then was looking very dark indeed, but for me the rain held off – yippee! 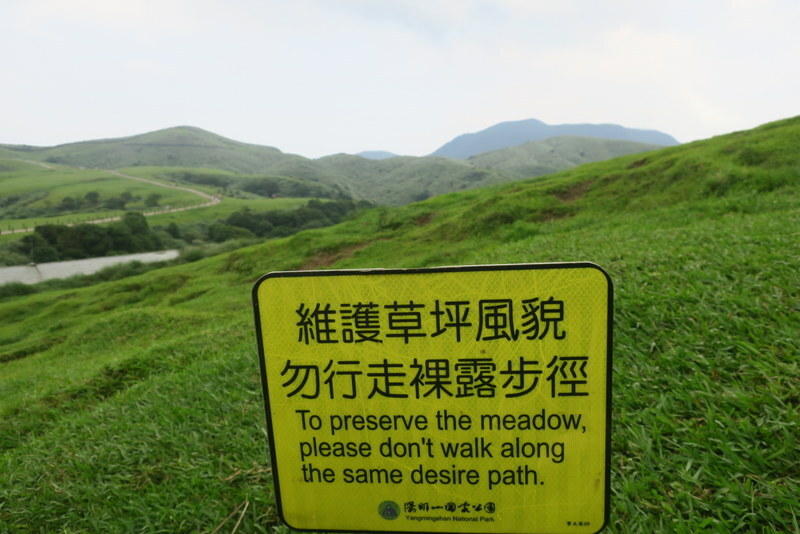 Thought you’d like to see one of the lovely signs, love the ‘desire path’…. 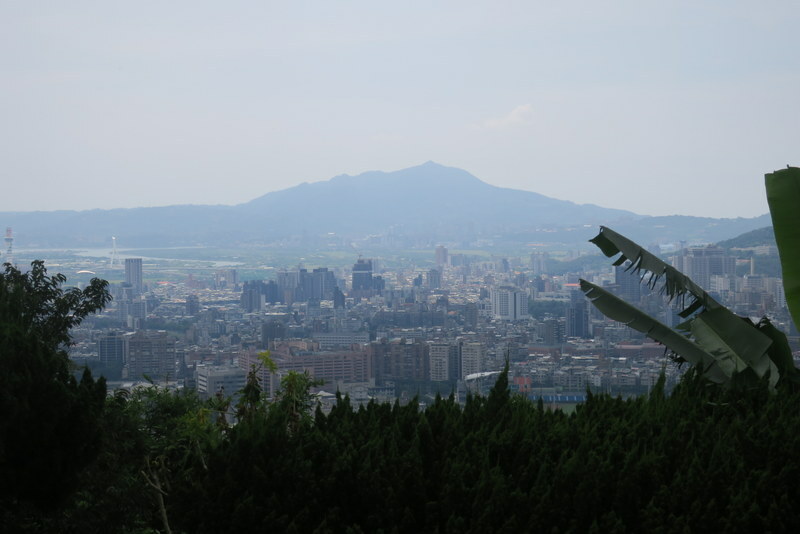 Ah yes, I love Yang-Ming Shan, such a great range of mountains, and so close and so convenient for Taipei! 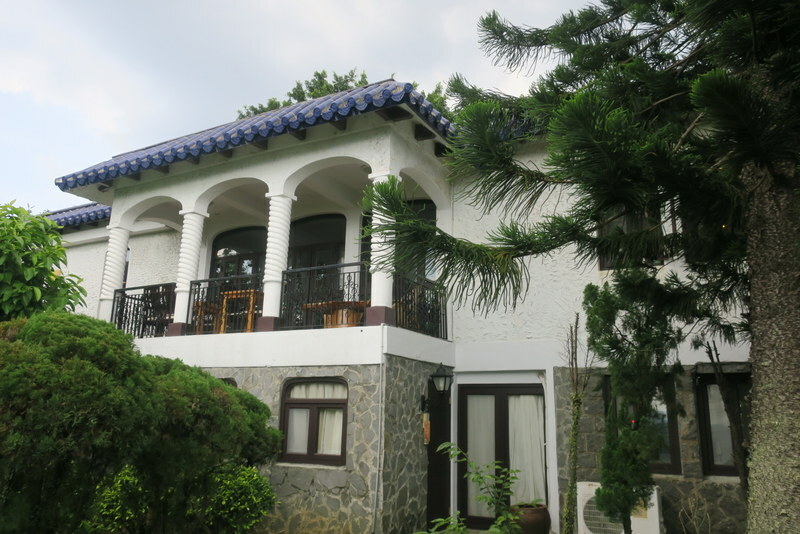 PS: It’s now nearly 7:00 pm and absolutely pouring down with rain here in Sanzhi!